The Champion's Club is a customer loyalty and rewards program. Similar to an airline miles program, the Champion's Club rewards customers for their loyalty to Sandia Golf Club. The program is designed for the local golfer who has flexibility with their golf schedule and can take advantage of the discounted green fees with a shorter reservation window while earning points towards free golf. 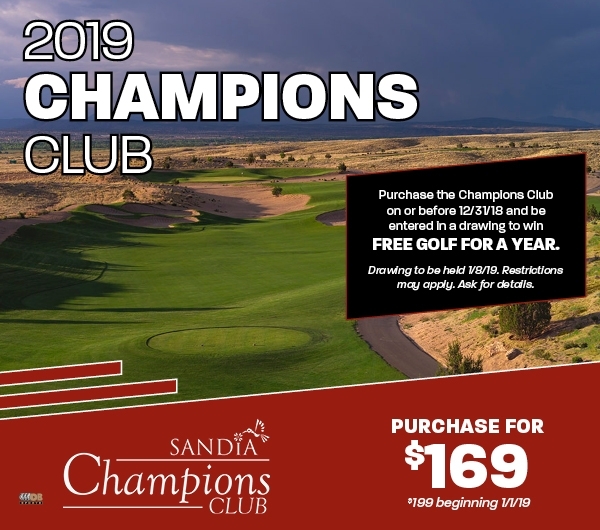 Along with many more exciting benefits, the Champion's Club is the perfect way to make the award winning Sandia Golf Club your golf home for 2019.